Cut the stem off and then cut in half. Cut pumpkin halves into quarters or thirds. Place in a slow cooker large enough to hold the pieces. Cook on low heat for 6-8 hours or until the flesh of the pumpkin is tender. Blend pumpkin flesh until smooth. 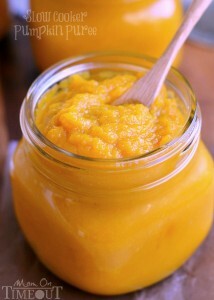 Pumpkin puree can be frozen in freezer bags or refrigerated for up to 1 week. You can save the seeds to make your favorite pumpkin seed recipe. Did you know you can also use jack-o-lanterns for puree, and not just pie pumpkins? Just strain the excess water.